Last Giveaway-With Pearls and Pumps! Today is our last giveaway of the "Celebrating MOM" event. And it's with my sister-in-law's darling Etsy shop! Larissa is super-talented at finding just the right combinations to make her jewelry look beautifully elegant, but totally different from everyone else's. And her prices are very reasonable, too! I love it! So random! But today, instead of just picking one winner, we're going to pick three! *3rd prize will get an 11x14 print of their choice from her shop! One comment per person please! 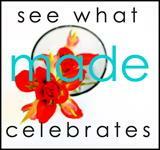 See how Dana's Celebrating MOM today! I LOVE the "Grandma Pearl" necklace!!! My absolute favorite are the "City Lights" earrings! 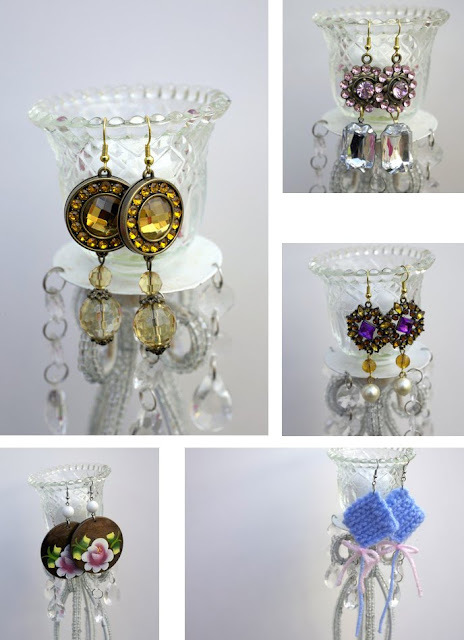 I love the Avatar earrings and the damask earrings- she has great prices!! I really like "The Volturi", the color of the bow is lovely. It's a tough choice between the "grandma pearl" necklace or the "pomp and circumstance" one! Love them!!! The Lariat earrings are too chic and fun. I can just feel those chains swinging off of my lobes! Oh, it is so hard to choose which is my favorite!! But it would probably have to be the Grandma Pearl necklace with the Antoinette necklace coming in a very close second!! LOVE! I like "Widow's Web" necklace. Pearls with a fun spider, great! I love the dark court! Hope I win!!! I love the Wosley necklace! The Secret Flower Garden Necklace!!!! So awesome!!! Love the MAMA BIRDIE and KENSINGTON GARDEN necklaces. Very unique designs..love 'em.. I like the grandma pearl necklace, it's so sweet. Please don't make me pick just one!!! Love the I Heart You necklace, the KaPow earrings, Clara earrings...Ok, I'll stop there...but I can't wait to go shopping there! Pick me! I love the clara earrings. So cute. The Grandma Pearl necklace is my favorite! I love how it has pearls AND fabric, its just adorable!!! My favorite is the Swan Dive necklace! Very cute! Well....3rd time is the charm.... keeping my fingers crossed! I love all of her stuff! oh my goodness, i love the Aberforth Dumbledore necklace!!! simply perfect! Most definitely the blossom print. Just like the bramley apple tree outside my bedroom window as a child!! Oooooh! I loooove the grandma pearl necklace too. It's so beautiful. I also love the 11x14 buttons print. It would be so fun for a craft room or laundry. Aberforth Dumbledore necklace....for sure!! The blue is breathtaking. Definitely the Buttons print. So whimsical and rich! Love, love, LOVE the Antoinette necklace!!! I love the Widow's Web! I love, love, love, love The Dark Court necklace! I love the Secret Flower Garden necklace and the Grandma Pearl necklace! Just beautiful! The jewelry are gorgeous, but I fall in love with the Singer TWO- 11x14 print. i'm loving the damask earrings and swan necklace! so pretty! i just love all those things!! I love the Swan Dive necklace, but I love all her stuff! Wow! So beautiful! I think my favorite is the Antoinette necklace. Thanks for the giveaway! I think my favorite is the orange passion or red damask earrings! I'm a sucker for big accessories! What a fun store!! They are all wonderful creations, but my favorite is Grandma's Pearl! THANKS! I cant pick just one, I think my fav favorite one is swan dive but I really love the fable neckalce too. I can't decide! I love Secret Flower Garden AND I love Alice Dreams!! I LOVE the Rose earrings! So simple! So beautiful!!! my email address is ohcatherinemayi at gmail dot com. My favorite is the Anabelle necklace. Absolutely beautiful! I think my favorite is "Swan Dive", but they're all great! I love the widow web necklace. I love "fable". So Darling. LOVE LOVE IT. Very difficult to choose, but I finally decided. :) My favorite item is the Kensington Gardens necklace. So elegant! Thank you, and have a gorgeous day! LOVE the damask earrings. OOOO hope I win! I LOVE the "Annabelle" necklace. LOVE it. My Favorite is the "Grandma Pearl Necklace". I love the pearls and flower. Breath-taking ! I'd have to go for the Grandma Pearl necklace too, it is beautiful. Fun stuff! My favorite is the "Grandma Pearl" Necklace...beautiful! I love everything!! But those KA-POW earrings are spectacular! So beautiful...I can't decide my favorite necklace between the: antoinette, volturi, dark court, and the stunning grandma's pearls! HAVE A GREAT MOM DAY!!! You have such a talented Family Disney, It is nice to see your love and support for them. Awesome stuff. I really love those Lariat Earrings she's created. I love dangly things!! Oh how beautiful. I love the grandmas necklace and I am picturing it on me now. I love them all! But I'm really lovin' the "grandma pearl" necklace. So beautiful! The Grandma Pearl looks super cute! This would go perfect with my dress for my graduation party! I love the Swan Dive necklace with it's chunky chain. Everything is just so beautiful, but my favourite would have to be "Widows Web"... it's so pretty! i'm not usually a jewelry girl... but those are just lovely. It's a tie between the grandma pearl necklace and the mama birdie necklace! love them both! love the annabelle necklace, and pretty much everything else! I love the Annabelle necklace! So lovely and pretty! amber (at) wamber (dot) com! Cute stuff! I like the secret flower garden necklace, and all the others! They are all so beautiful. I hope I win. Gorgeous shop! The jewelry is so elegant! My favorite are the orange passion earrings. I love the Grandma's Pearls necklace, it's gorgeous! I love the cute lace flower attached to the string of pearls. I love the Grandma Pearl Necklace the best but they are all beautiful! my favorite is the fable necklace- it was hard to choose! Here's another for grandma pearl necklace, although I honestly can't really pick a favorite! I want them all! I love the Seer necklace and the Albus Dumbledore necklace (mostly because it's called that)! Great shop! My favorite is the Antoinette, but the Mama Bird is a close second! I love the simple elagance of the Fable necklace! The color is absolutely striking. That would be the "buttons"-print. I'm torn between the Grandma Pearl Necklace and the Clara earrings! Both are so beautiful! And I love the blossoms print. Spring is my favorite time of the year and I love all the blossoms on the trees! I really like this shop. I love the Pomp and circumstane, Gramdma Pearl and Wosley necklaces, I also adore the Rose earings. Hope I win!!! Love India the Elephant Necklace! I LOVE the Grandma Pearl necklace! I hope I win! Oh my goodness! Sooo many great things! I LOVE LOVE LOVE The Seer necklace. So amazing! i love the walk like an egyptian earrings! I like the mama bird necklace! The button print would be so cute hanging in my sewing room. I love the "Buttons"-Print", would fit perfectly on the wall above my old mechanical sewing maschine. The Antoinette necklace is so pretty, and I like the Singer Two print. There are so many things! but I love the grandma pearl necklace and the "Blossom" picture, they're beautiful! The Annabelle necklace is so pretty! I love that blue cameo. ANYTHING in her shope would be awesome! i love the kite necklace!!!! super cute stuff! Oh, I lovelovelove the Kensington Gardens necklace. SO pretty. And the Wosley necklace. I couldn't pick just one, lol. my favorite is the annabelle necklace- so classy! love it. thanks for sharing! I love the Rainbow gypsy necklace. So cute! what a great shop to highlight! I love the swan dive necklace! So pretty! I love the "Swan Dive" necklace! I love the Grandma Pearl necklace the best. So cute! jesslinq at gmail dot com. 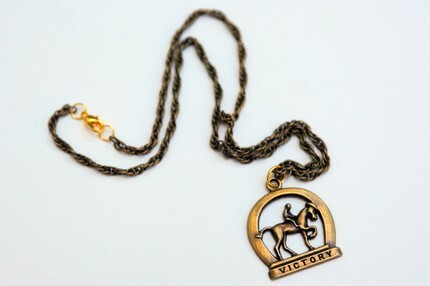 I love the Josephina and the Fable necklaces. They are beautiful!! I just love the Pomp and Circumstance necklace. It is very cute. I also like the photos. The photo of the mason jars full of buttons would go so well in my sewing room! I love the Secret Garden necklace...very elegent! I love the Grandma Pearl necklace. So classy with a little modern mixed in. Crossing my toes! Talk about cute jewelry! My favorite are the Clara earrings. I think I fell in love with the Widow's Web necklace. I love the Annabelle necklace, it is so elegant and ladylike! How could anyone choose just one item?!?!?! They are all beautiful. She is so very talented. Loving the Secret Garden necklace and the Josephina Necklace...unique and fun! I love the "Mama Bird" necklace!!! I love the Ka Pow Earrings the best!!!! However, everything she has is soo beautiful it was hard to pick just 1! I love the Secret Garden necklace. Sooo pretty! Oh, I just LOVE, LOVE, LOVE the Grandma Pearl necklace, as well as the Avatar earrings! The necklace is so....Victorian Julia Child! I ADORE it!!! Beautiful stuff--I love the vintage feel of this fabulous jewelry. That said, I simply adore the "Grandma Pearl" necklace. Too cute! I love, love, LOVE the Dark Court necklace. Beautiful! It is SO hard to pick a favorite, but I love "Swan Dive" I hope I win! First off, thank you for such a fun celebration of moms! You and Dana are superheroes! Your sister's shop is lovely, and I absolutely LOVE the "Walk Like an Egyptian" earrings! What a gorgeous combination! Oh my! I love everything!! Pomp and Circumstance, Aberforth Dumbledore and Walk Like an Egyptian are 3 faves. I can't wait for the drawing....so I can buy something even if I don't win. I think I like Josephina the best. So hard to just choose 1 favorite.. So I'm not. I love the Orange Passion and the KA-POW earrings. So pretty and feminine. I love the "annabell" necklace! I love the Widows Web and the Wosley! Gorgeous stuff! 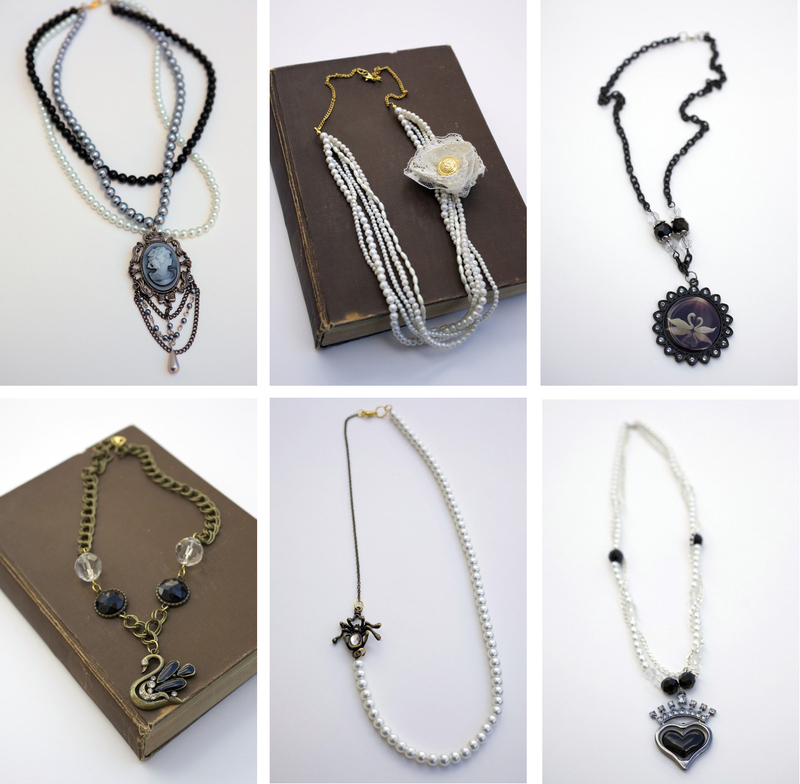 I love both "The Widow's Web" necklace and "Grandma's Pearls" necklace. So creative! Such a talented lady! I love the secret garden necklace. I'm diggin the Secret Flower Garden necklace...it was hard to choose...every piece is gorgeous! I love the Grandma Pearl necklace! Exquisite! The red dirt road earrings caught my eye. wow - so many beautiful things to pick a favorite from. but I THINK Cardinal is my actual favorite. I think. They're both captivating pieces. and those kite earrings! and kite necklace! so cute! they're a close 3rd and 4th! OMG!!! How do I love them. They look so pretty perfect. Congrats to the Desinger. Very good Job!!! I like the antoinette necklace. Pretty! Wow that jewelry is so pretty!! My fav is 'The Seer' necklace. It is really unique. This was such a hard decision. I finally pared it down to the Fable necklace and either the Clara or Orange Passion earrings. LuV LUv the Vultori, and the Dark court AND the Kensington Gardens. Beautiful work!!! Thanks for the giveaway!! My favorite is the Antoinette because it's very not me, and I'm trying to do new things. I like the gold Albus Dumbledore necklace! I love "Sybill" and "Aberforth Dumbledore." What can I say, I'm a sucker for blue. Although I very rarely enter I wanted to thank you for taking the time to host giveaways and maintaining such an incredible blog. I like the Kensington Gardens necklace--great colors! oh i like widows web, it's funky and i like that! Love the Mama Birdie necklace and KA-POW earrings! Thank you! the albus dumbldore necklace! Not only am i a harry potter fan, but it is just adorable:) Love the color! Singer print is great too. :) Guess I just told what I would buy if i win!!! My favorite is the "Aberforth Dumbledore". So, simple yet, so elegant. However, I would LOVE to be able to give my sister-in-law the "Victory" horse necklace because she does equine therapy with abused children. What a great gift for her!!! i love the mama bird necklace!! I love the pieces but think Antoinette is my favorite- perhaps because I celebrated my most recent birthday in Paris. Love Secret Flower Garden and Grandma Pearl. I also love the names of her pieces, so creative. I love the Grandma Pearl and that would be my choice. Ummm, one favorite!? You've got to be kidding. I really like "Pomp and Circumstance", "The Kite Necklace", and "Buttons" print. Love the Aberforth Dumbledore necklace! I love the secret garden necklace and the avatar earrings. sooo pretty! ok, there's about 30 things that I love (oh wait, that's everything), super love the albus dumbeldore necklace (love hp), and the pic of the singer sewing maching...so perfect for a sewing room!! Wow! Too difficult to choose just one! I love these four necklaces: secret garden, annabelle, the volturi, and Mama Birdie. I haven' had much luck yet, but.....maybe...this....time?!? I love the grandma pearl necklace! Grandma Pearl or Antoinette. Both very sweet and special. What a fun shop! Fable is my favorite. I love her style! I would say my favorite is Grandma's pearls or Victory! :) Hope I win,..I could use a little cheering up! I love the secret garden necklace. I think I have a little bit of Julia Child in me and could wear pearls and an apron anyday. I adore the Annabelle necklace.. of course that may be because Annabelle Lee is my favorite poem :) The necklace is elegant and gorgeous!